BROTHER FRANCIS WEIGAND, O.S.B., a monk of Mount Angel Abbey in Oregon, U.S.A., passed peacefully to the Lord on the 24th day of October, 2018, some days after suffering a stroke that marked the end of his earthly life. He was 86 years of age, and 38 years professed as a monk. Brother Francis was born in 1932 in the city of Aberdeen, Washington, where he was baptized with the name of Harold. His family later moved to the town of Tekoa in southeast Washington, and here he completed his primary and secondary education before the family’s further move to Spokane, Washington. Harold was one of four boys in the Weigand family, and one of the boys, William, was to become the Bishop of Salt Lake City, Utah, and later the Bishop of Sacramento, California. From 1950 to 1955 Harold attended Gonzaga University in Spokane, and in the following two decades his work included over ten years as a construction inspector for the city of Spokane. Here he also married and raised a family of three children. 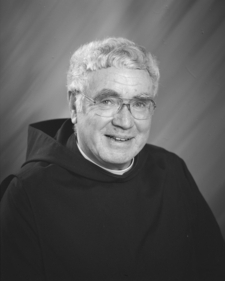 In the late 1970’s the further discernment of his service of the Lord led him to Mount Angel Abbey where, in September of 1980, at the age of 48, he made his profession as a monk into the hands of Abbot Bonaventure Zerr, O.S.B., who gave him the name of Francis. Brother Francis always remained a strong witness of his Catholic faith, and not least among his personal gifts were his dry wit and wry smile! He served the monastic community in many ways over the years—in the development office, in the library, on the grounds, and in the delivery of the mail. In more recent years Brother Francis served as a driver, providing transport for elderly and infirm monks’ medical appointments, for the delivery and pickup of people to and from the Portland airport, and for whatever other needs that might arise. Even in his final years he remained a driver of sorts, his vehicle being the little walker that he kept parked outside his door! May he rest forever in the peace of Christ.